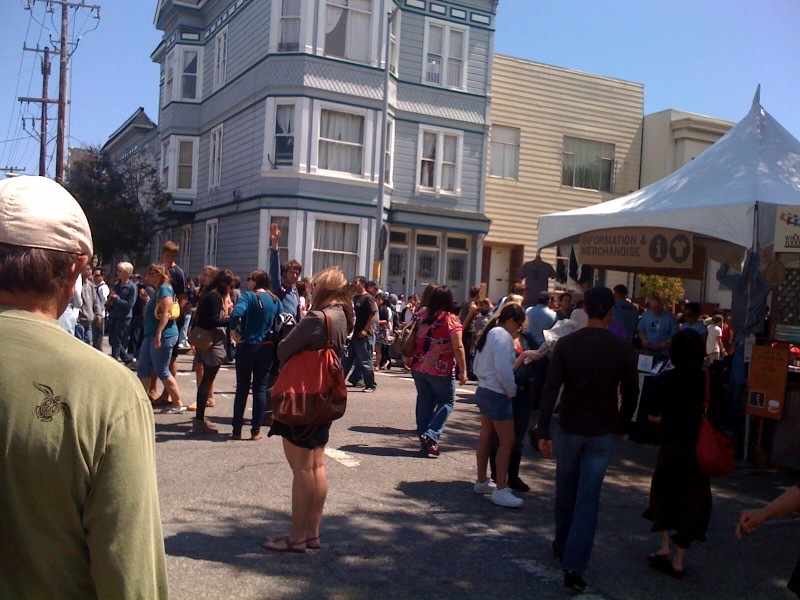 Saturday, August 18th was the fourth annual San Francisco Street Food Festival. 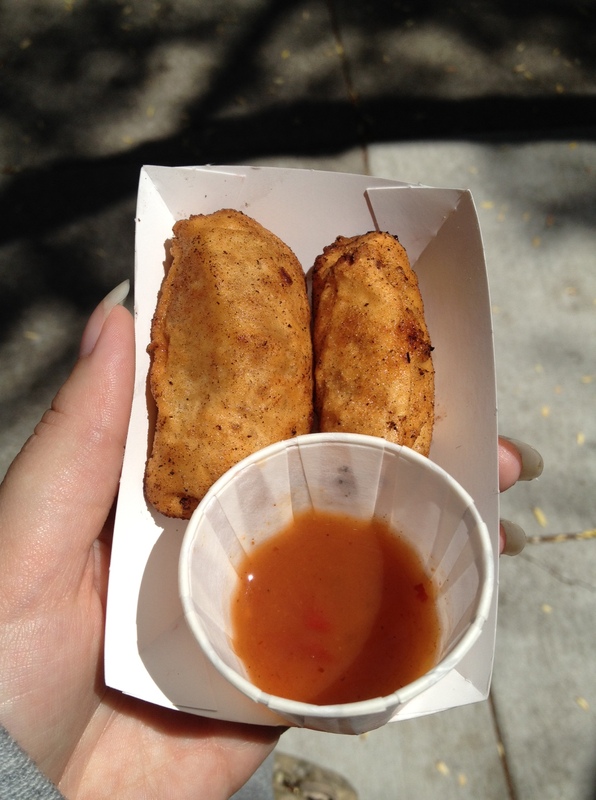 It was my second year in a row attending, and I thought I’d skip ahead of some of my other food truck experiences since my last post to write about this momentous event in any street food lover’s life. Now, I have trouble knowing whether I should count most of the vendors at this event as mobile vendors whose food I’ve eaten. 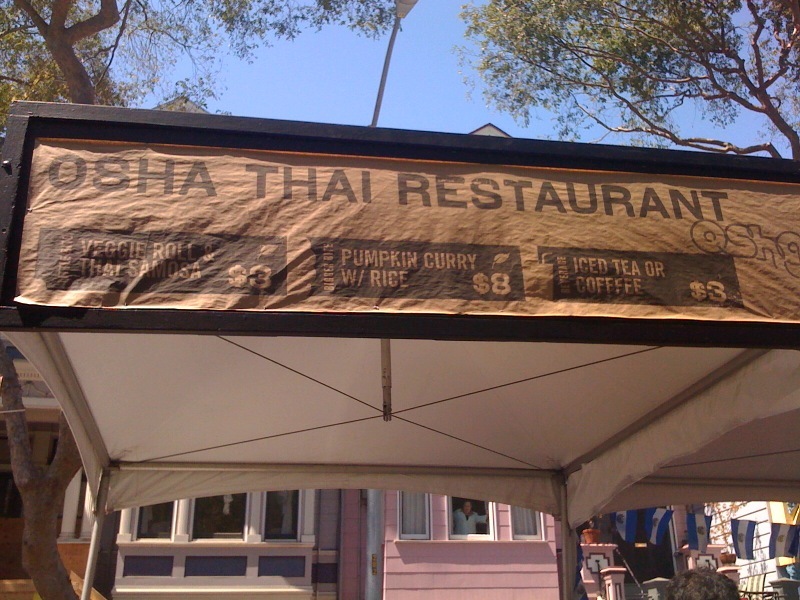 When I went last year I counted them, and I did the same for the Eat Real festival, but I didn’t really think much about it or look into whether the booths were run by actual mobile vendors or just restaurants who wanted a booth for a day. Obviously most of them are not “trucks”, but I also count carts toward my big list of trucks to the left. 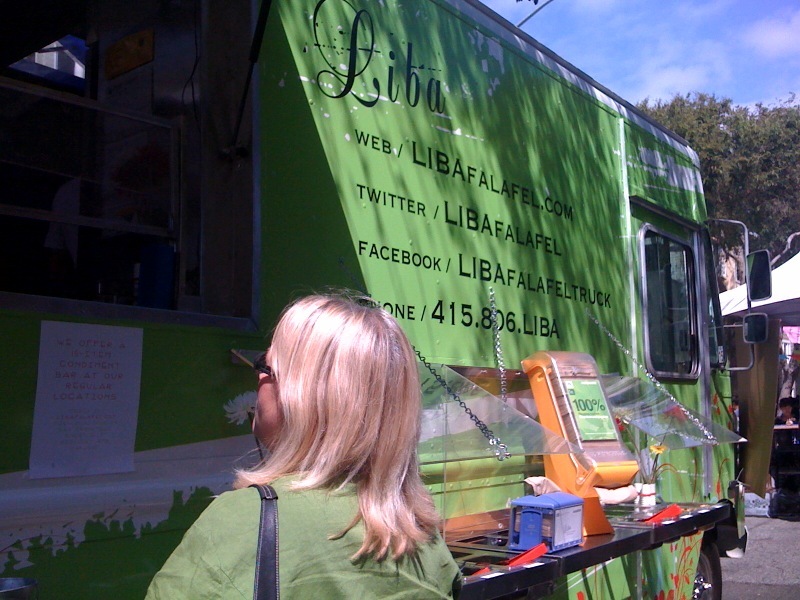 If a small business doesn’t have a truck or a cart but often sells at various farmer’s markets and other street food events, are they still a mobile vendor? 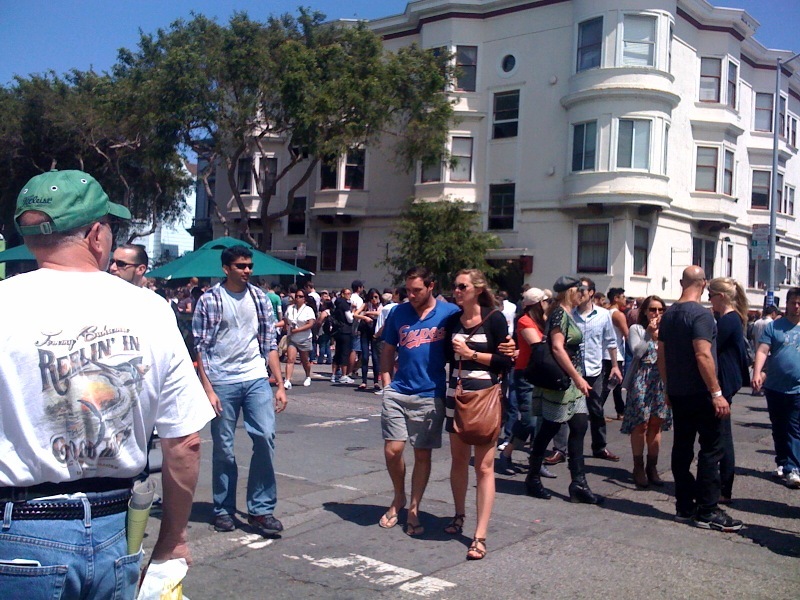 What if they have a brick and mortar restaurant but also sell at these events? If I automatically discredit any brick and mortar, then that would take many trucks off my list who have both trucks and brick and mortars! I don’t know how to answer these questions, but I’d love to hear your opinions. When I tweeted that Kyle and I had achieved a double Pacman because we ate at 10 booths on the day of the event, Food Truck Nerd said a Pacman can only be completed at establishments that are on wheels, i.e. trucks and carts. I don’t know if it’s quite so black and white for me. 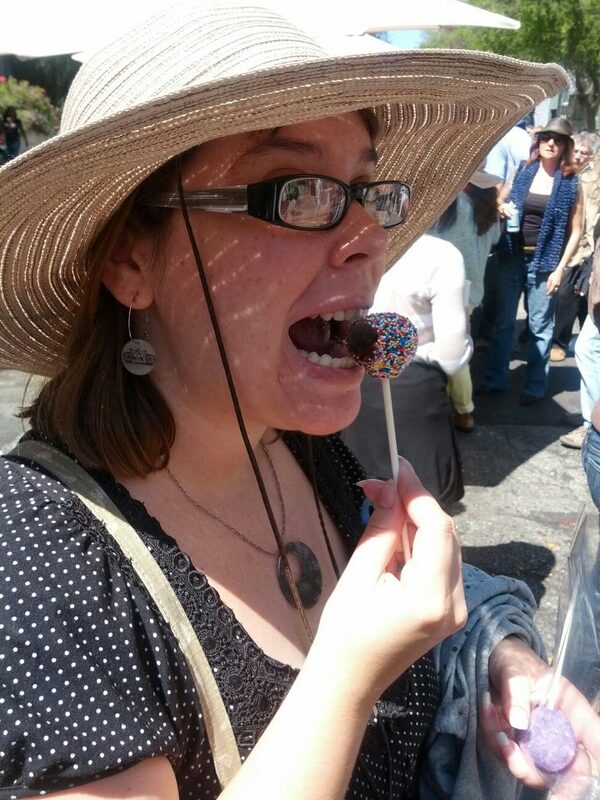 Regardless, I’m going to put the street food vendors I’ve enjoyed on my list, because the list is there to act as a reference for people who are interested in street food. Yes, it’s also partially there for bragging rights, but I think I’ve been to enough outright trucks to validate my claim that I’m experienced in that arena. Now, let’s get started. Kyle and I arrived about a half hour after the event had begun. Our goal this year was to only eat “small bites” so we could try as many different places as possible. Last year I made the mistake of starting with a “big bite” and didn’t have room for very many vendors as a result. I’m happy to say the little leaves that signify vegetarian options on the menus were back, and V’s were there for those that were vegan. This made it much easier for us to pick out our food. Some booths we could just walk right by because there were no leaves. And, best of all, we didn’t have to play the, “I wonder if that’s vegetarian or not” game that sometimes ends with waiting in a line for no reason. I had also looked through all the menu options on the festivals’ iPhone app the day before and marked the ones I thought I might enjoy (although there weren’t any leaves on that). 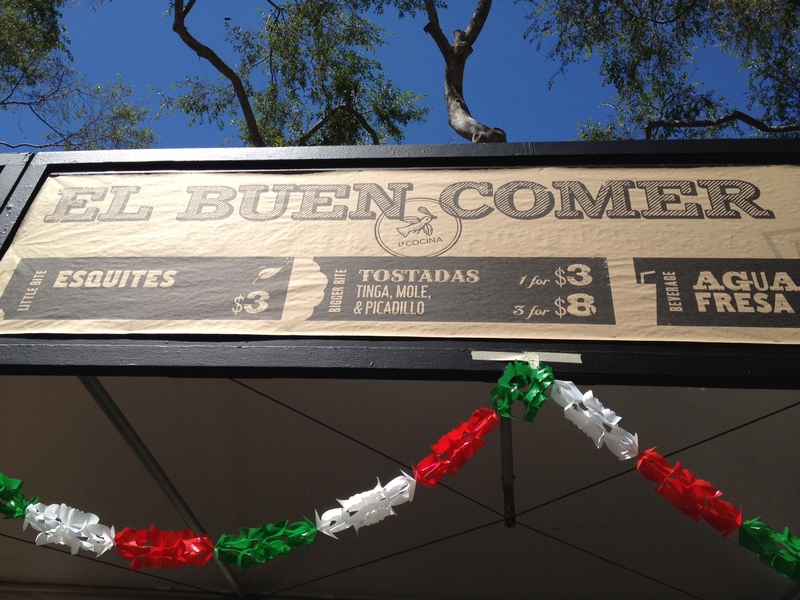 Our first stop was a booth called El Buen Comer. I’ve tried to find a website or some sort of internet presence for them, but this seems to be a rather common business name. 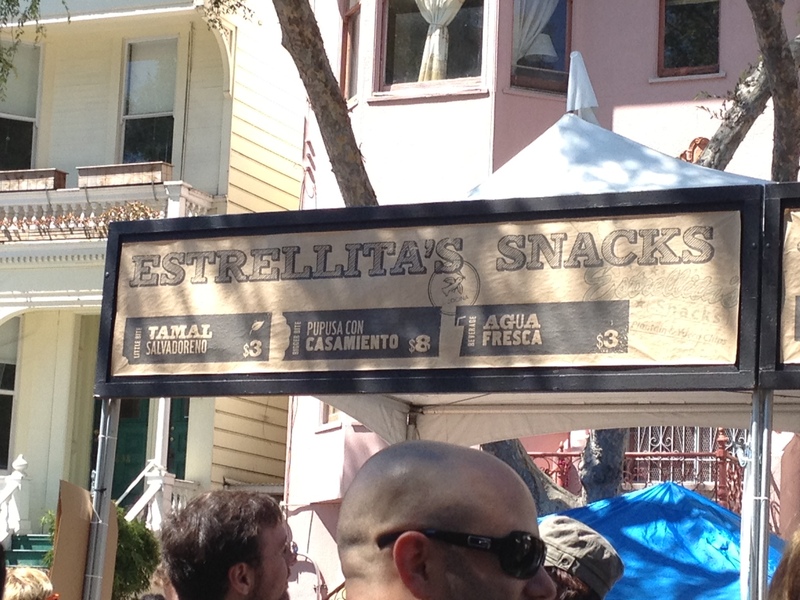 (It translates to “good eating” in Spanish, after all.) I suppose a photo of their booth will have to do. 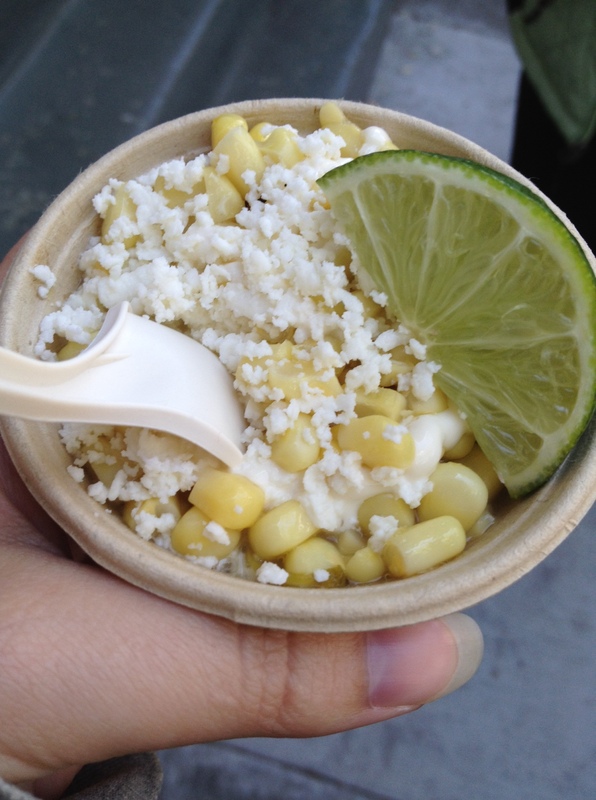 I ordered the esquites, because who doesn’t love corn and cheese? It was a good start to our meal. 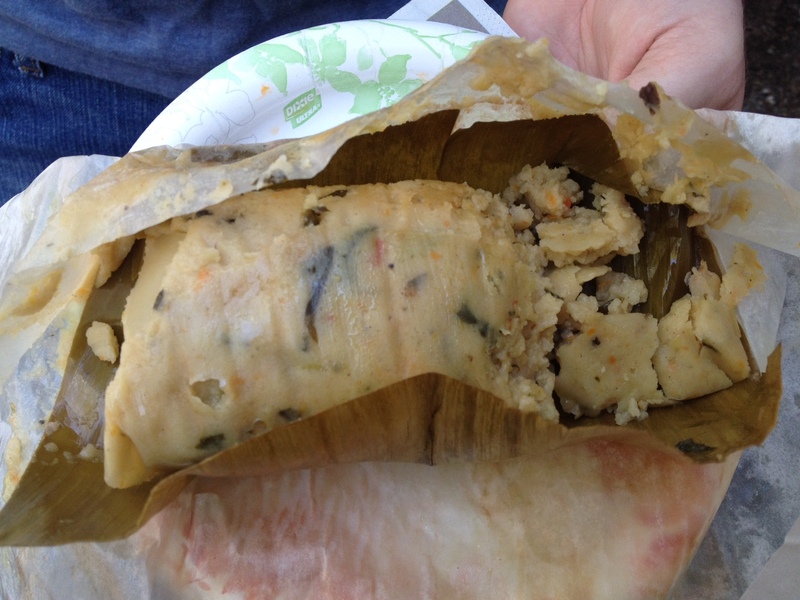 Meanwhile, Kyle headed over to Estrellita’s Snacks to grab their tamal salvadoreno. I hadn’t had a tamale in awhile because they usually have meat in them, so I was happy to help Kyle gobble it up in no time. Then we were on our way to our next booth. 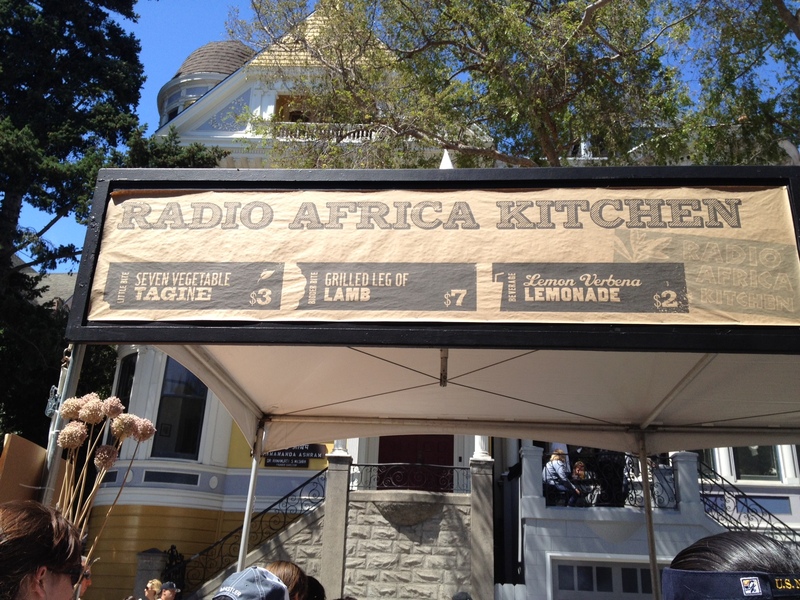 Radio Africa Kitchen was serving a seven vegetable tagine that sounded delicious. 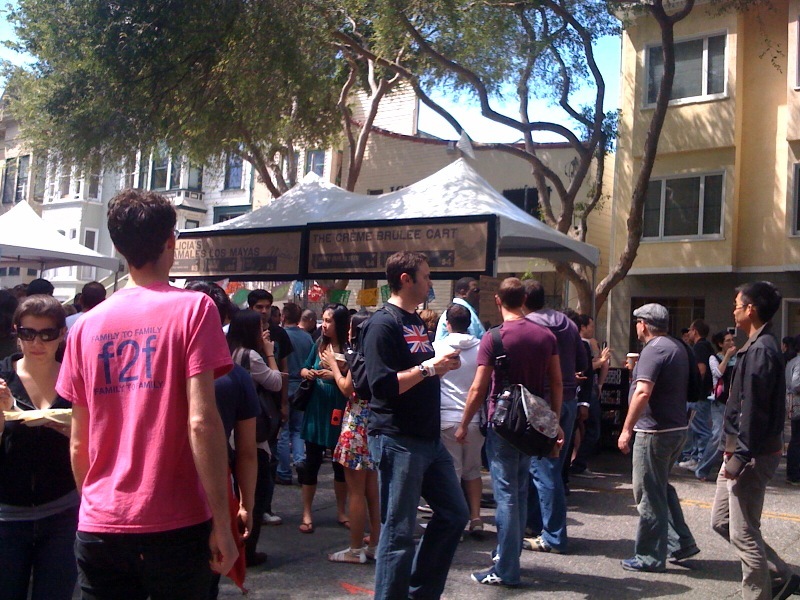 This was probably the longest line I waited in all day, and it was mostly long because of their leg of lamb option. It still only took about ten minutes to get to the front, and while all the meat eaters had to wait longer for their meat to be cooked, my veggies were already sitting and waiting for me when I ordered them. It was definitely worth the wait (especially since it wasn’t much of a wait at all). We especially enjoyed the potatoes and had to agree to split them evenly. 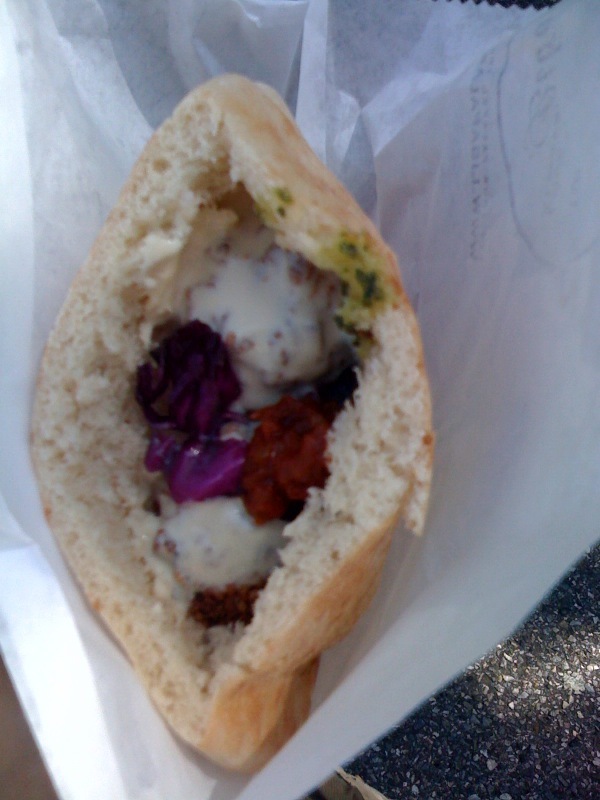 I loved the sauce on top that reminded me of pesto but had a little more kick to it. 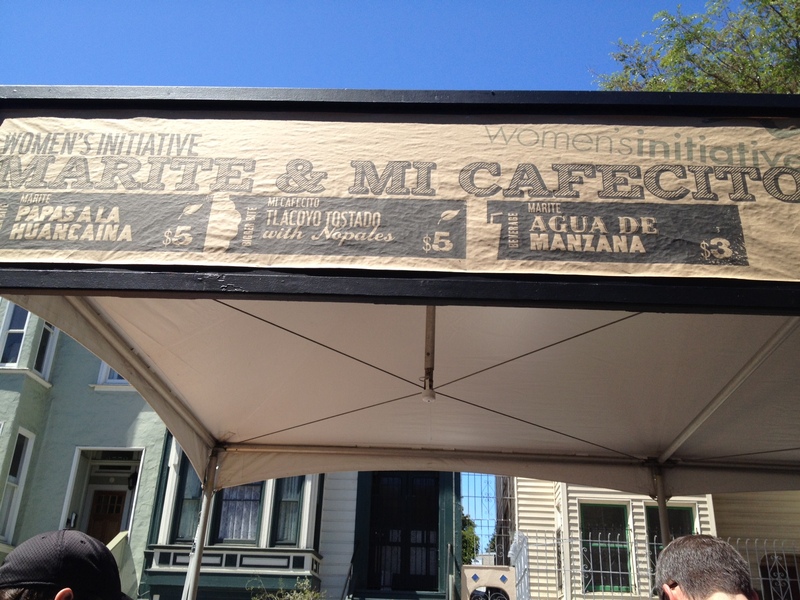 Next, we headed to Marite and Mi Cafecito, another one I couldn’t find info for online. I think this might have something to do with how their booth had “Women’s Initiative” written on it; maybe it’s not an operating business yet. 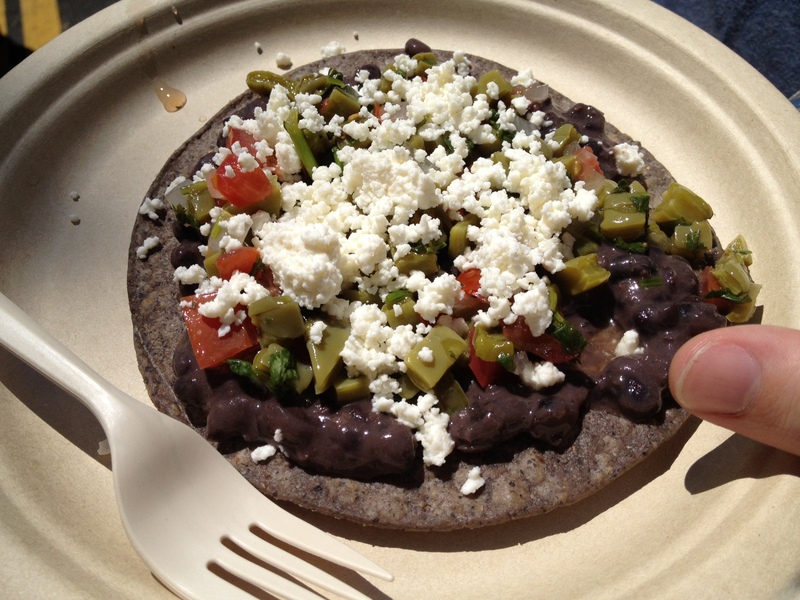 Although it was technically a “bigger bite”, Kyle convinced me to get the tlacoyo tostado with nopales. He mostly wanted to try it because he knew “nopales” meant cactus. 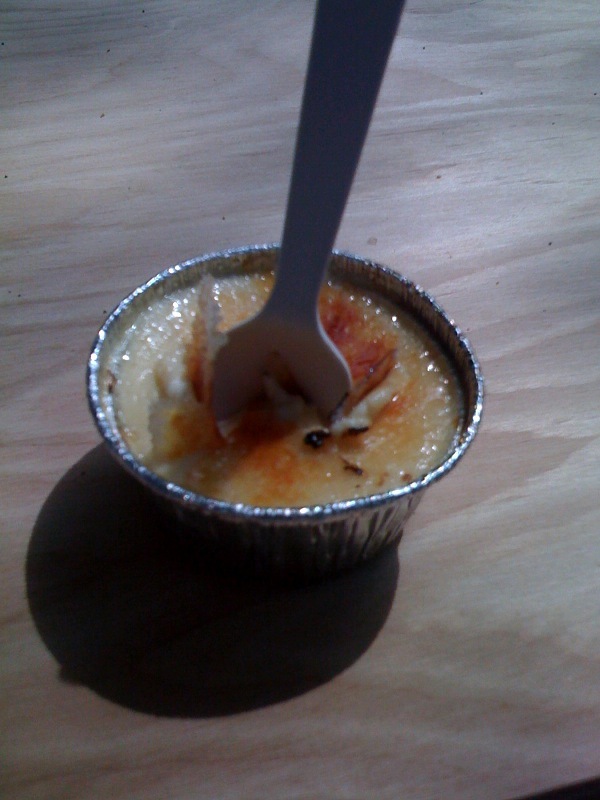 Also, it was only $5, and I think it only counted as a “bigger bite” because “small bites” were $3. It wasn’t that big at all. I hadn’t ever had cactus before, and I would have just thought it was any other green vegetable if Kyle hadn’t told me it wasn’t. There were so many flavors in the tostado, so I’m not sure which one was the cactus. Regardless, the whole thing was delicious. Our next stop was Azalina’s, which was serving a peanut tofu taco I wanted to try. 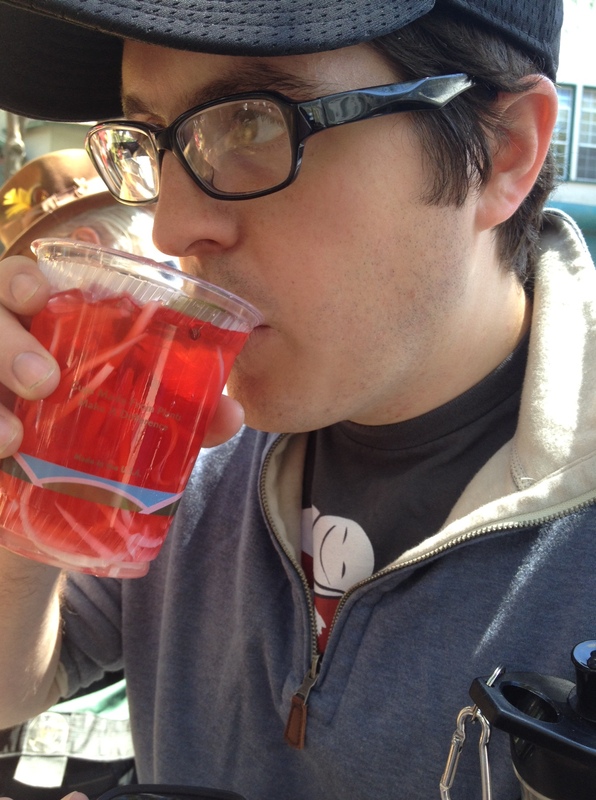 When Kyle saw rose flavored water with coconut and basil on the menu, he had to have that as well. I don’t like coconut, but I tried a sip of the water and found it to be refreshing and not too coconut-y. Of course, being the coconut lover that he is, Kyle dug all the pieces of coconut out of it when he was done and ate them up. 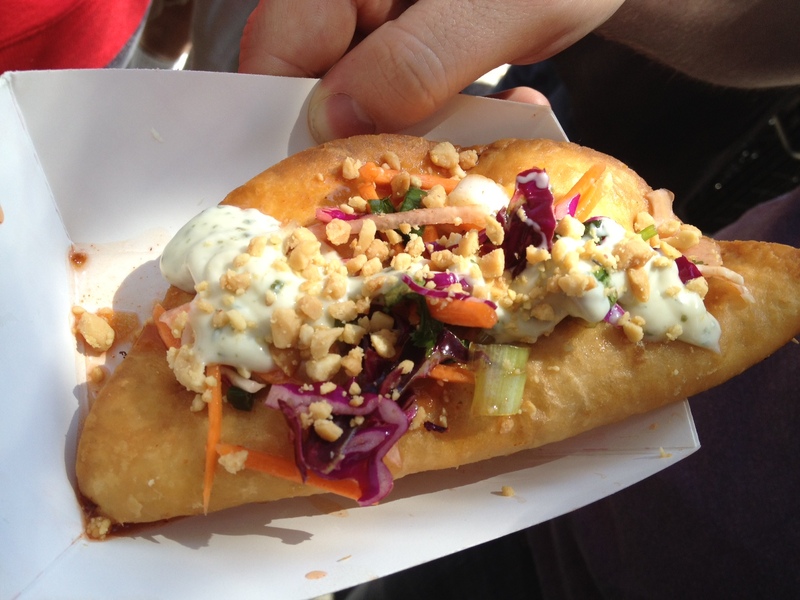 The peanut tofu taco was my favorite thing I ate all day. 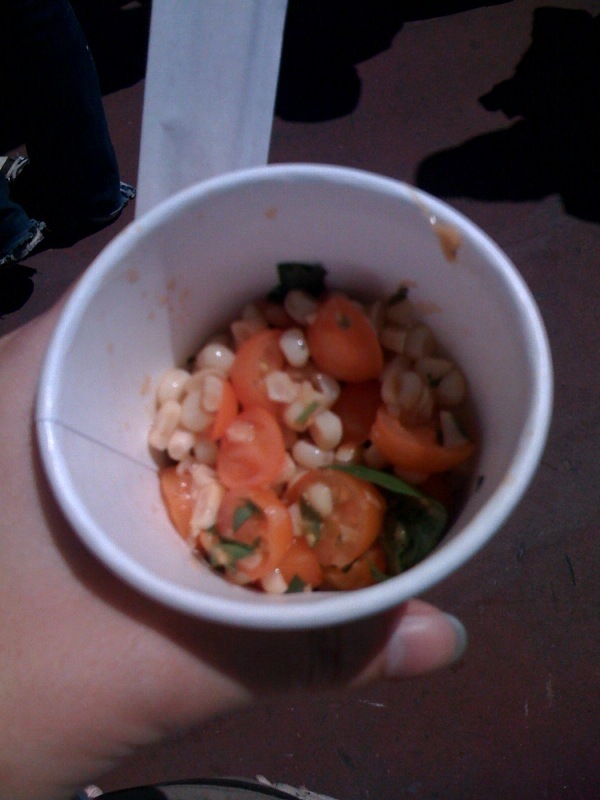 It was just bursting with various flavors, and it was spicy too! My only complaint was that they left in the sticks that were used to hold the dough together, and I kept accidentally biting into them. I posted the photo of Kyle drinking his rose water on facebook, and my cousin commented asking if it was from Azalina’s. When I confirmed, she told me that they’re catering her wedding next summer! I’m super excited to try more of their food. Having grown up in Malaysia, my cousin knows good Malaysian food. Her dad cooks the best curry I’ve ever had, so I’m super, super excited for her wedding now (as if I wasn’t already). 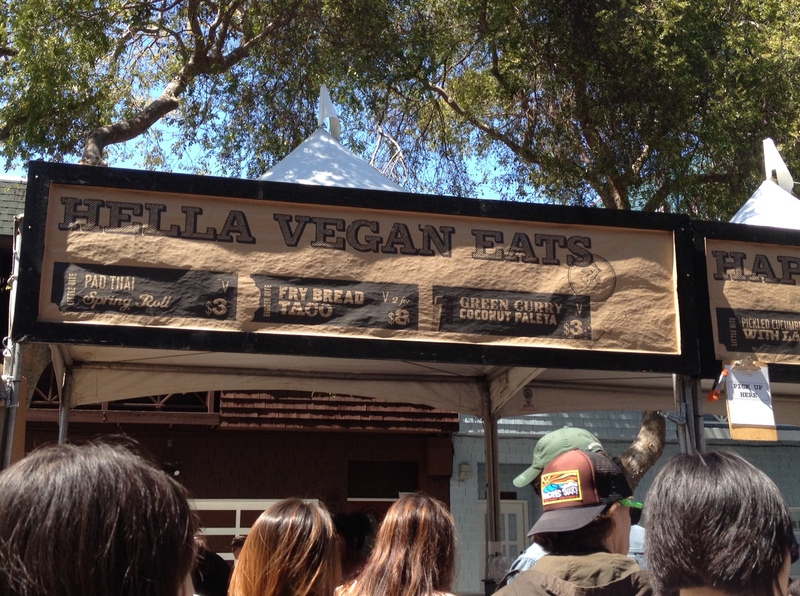 Next, we finally tracked down a booth I had been looking forward to since the list of vendors was announced, Hella Vegan Eats. 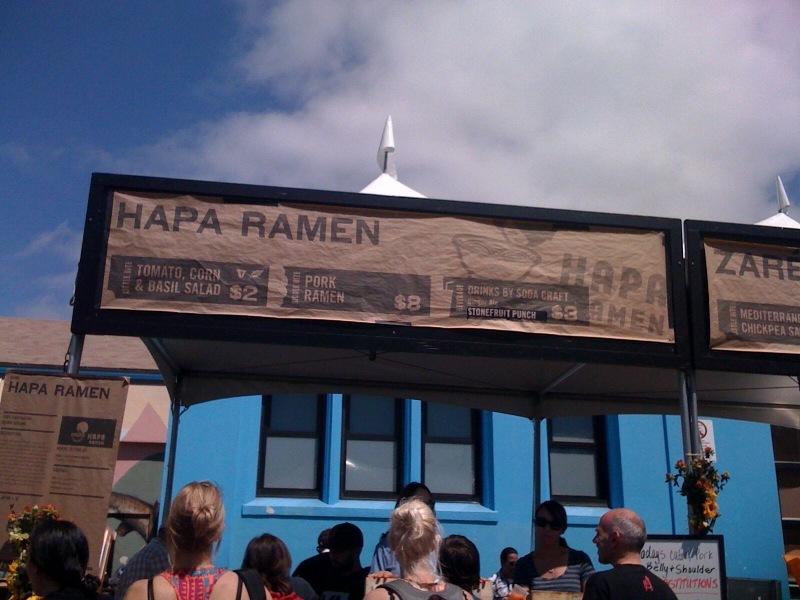 They had a system where they took your order, wrote your name down on a container, and then had you wait next to the booth for you name to be called (similar to a food truck). There were a few of us waiting for pad thai spring rolls, and they were in the process of cooking a batch of them. While we waited, the people working the booth entertained us by saying their spring rolls were cooked with love, asking us to give thumbs-ups if we were having a good day, and asking us to give thumbs-ups if we were beautiful people. They were definitely the most spirited booth we went to. Our spring rolls were fresh out of the oven and HOT. 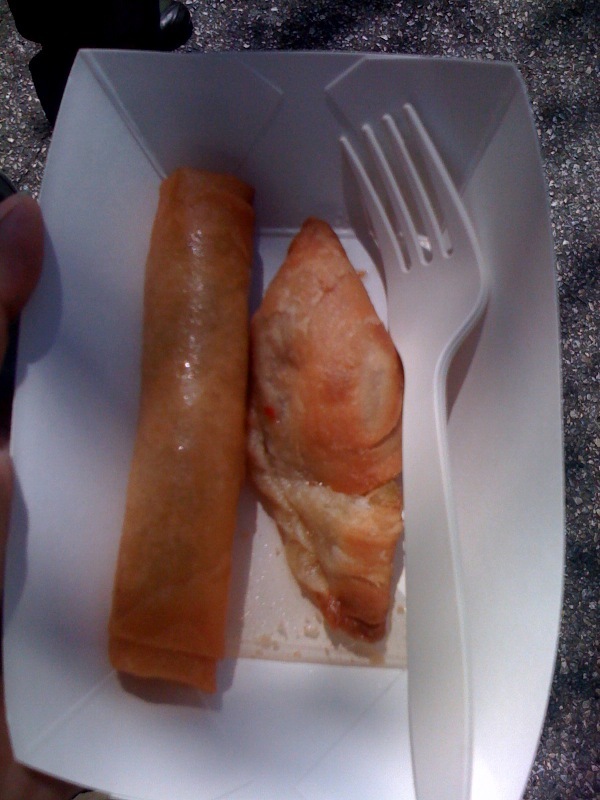 The sauce that came with them was probably the best part, complementing the spring rolls very well. 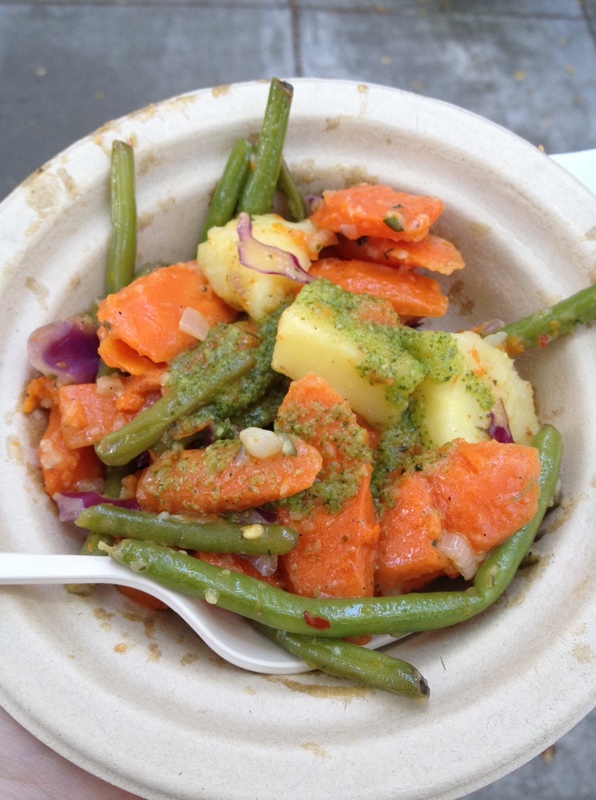 Hella Vegan Eats is trying to obtain their own food truck to hit the streets. (Right now they just cater.) If you’d like to donate, you can find the campaign here. At this point, we started thinking about dessert. 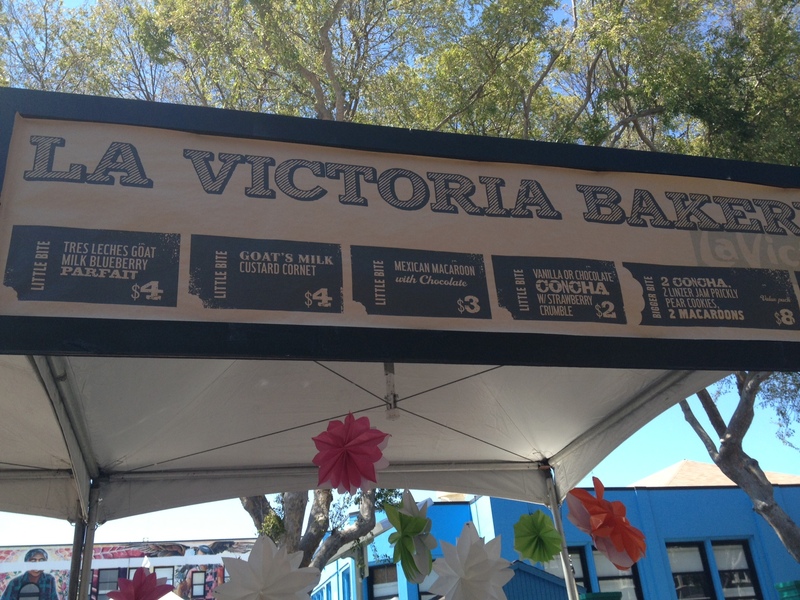 Kyle spotted a goats milk custard cornet at La Victoria Bakery and had to have it. I’m not a huge fan of custard, so I only had a bite. 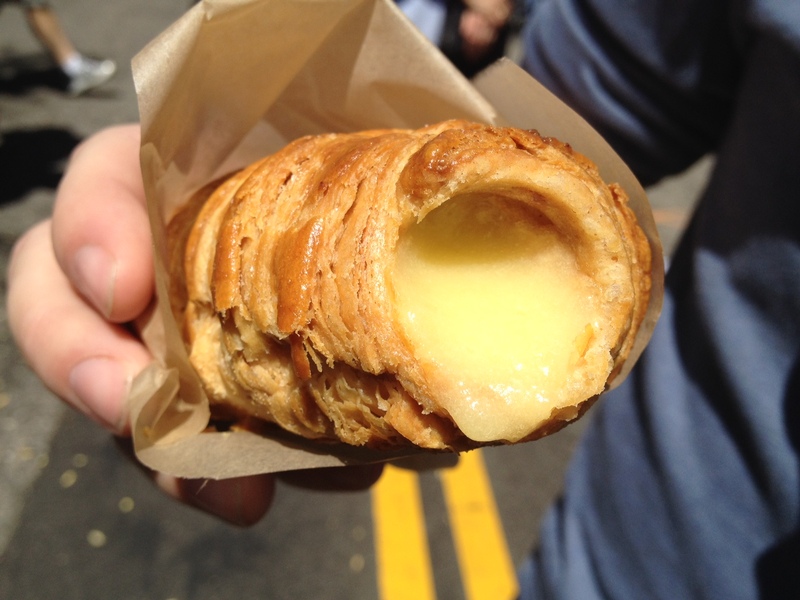 What I could appreciate was the pastry surrounding it, which was flaky and cooked to a crisp. 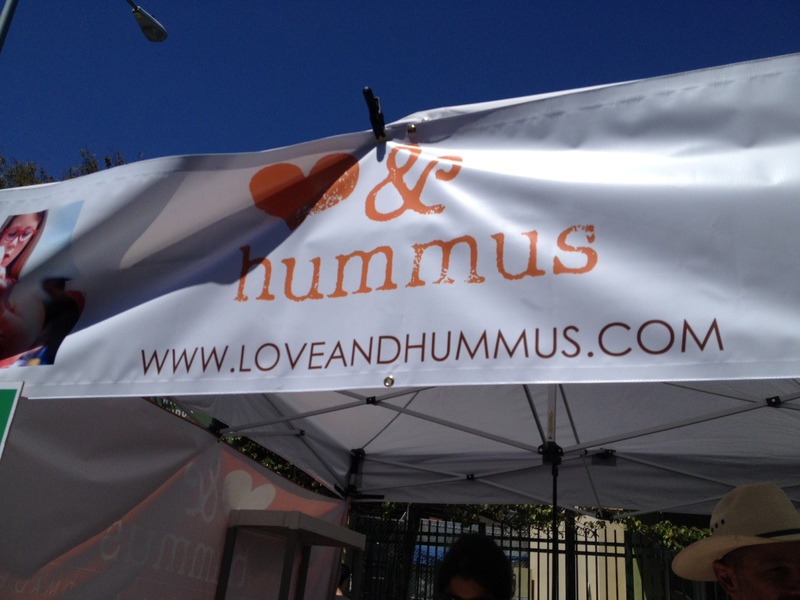 At this point I put the hunt for dessert on hold when I saw the Love and Hummus booth. I can’t resist good hummus when I see it. They gave me the option to choose either pita chips or veggies with my hummus, and I decided to go with the healthier choice. 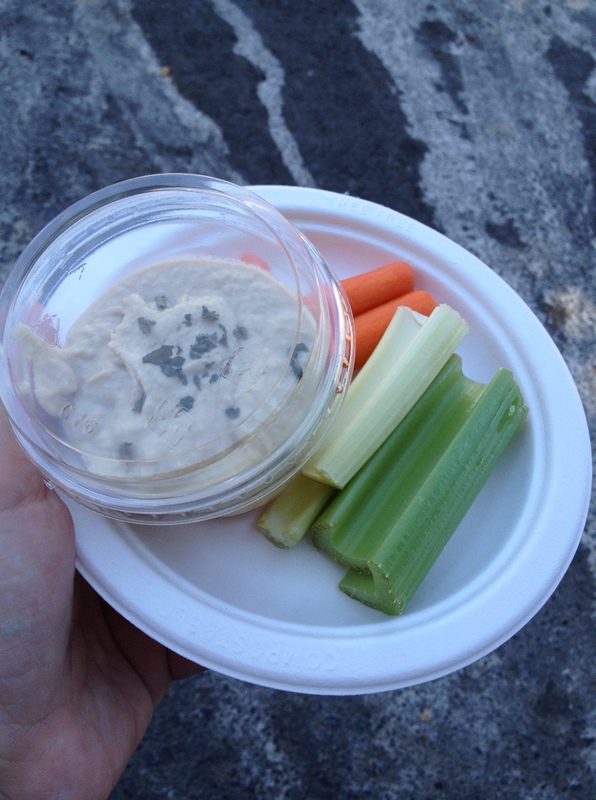 There was plenty of hummus left over after I finished my veggies, so I got to take a snack home to enjoy later too! 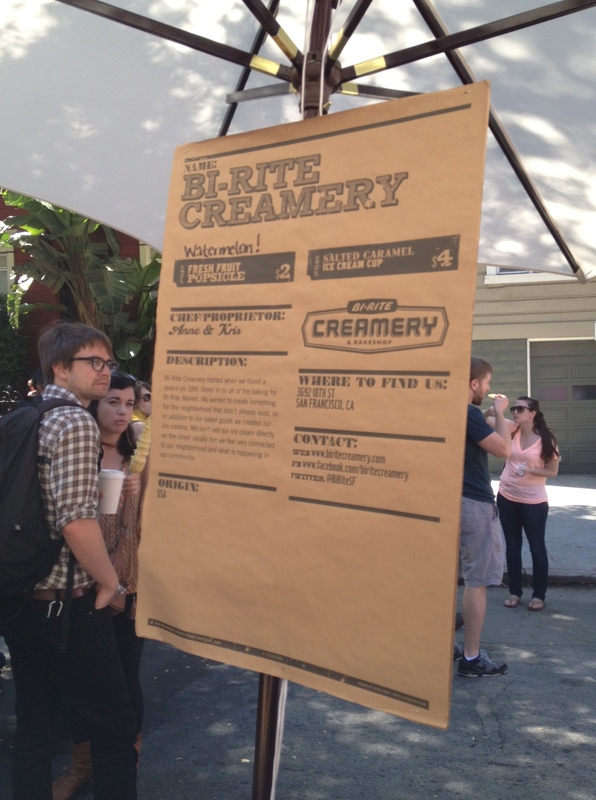 We moved forward with dessert at our next stop, Bi-Rite Creamery. 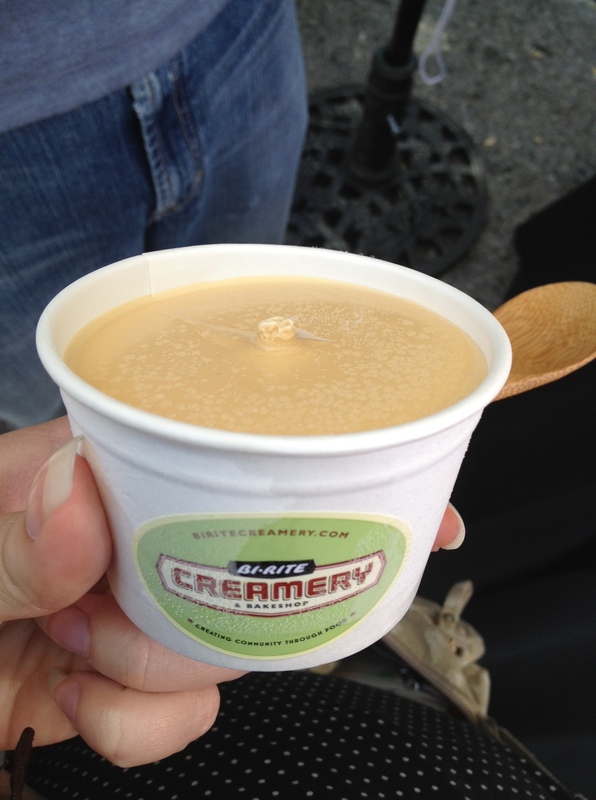 I went with the cup of salted caramel ice cream, and I had to keep asking Kyle to help me out because it was so filling I was afraid I couldn’t finish it! Luckily, it was also quite tasty, so convincing him to have some wasn’t difficult. Thanks to Kyle’s help with the ice cream, I had room for one last small dessert before we called it a day. La Luna Cupcakes had some perfectly tiny dessert options. 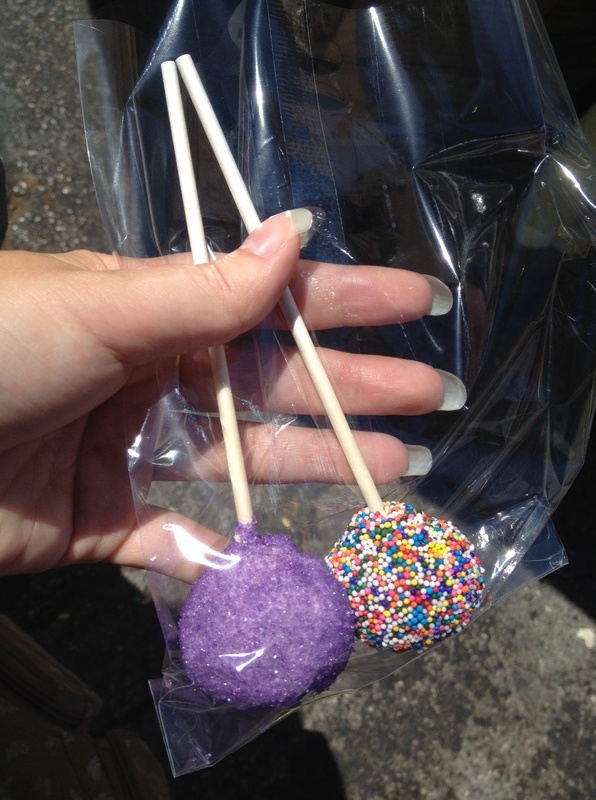 I decided on a cake pop, but they were sold two at a time for $5. I figured I could take one home for later. I got a chocolate and a red velvet. 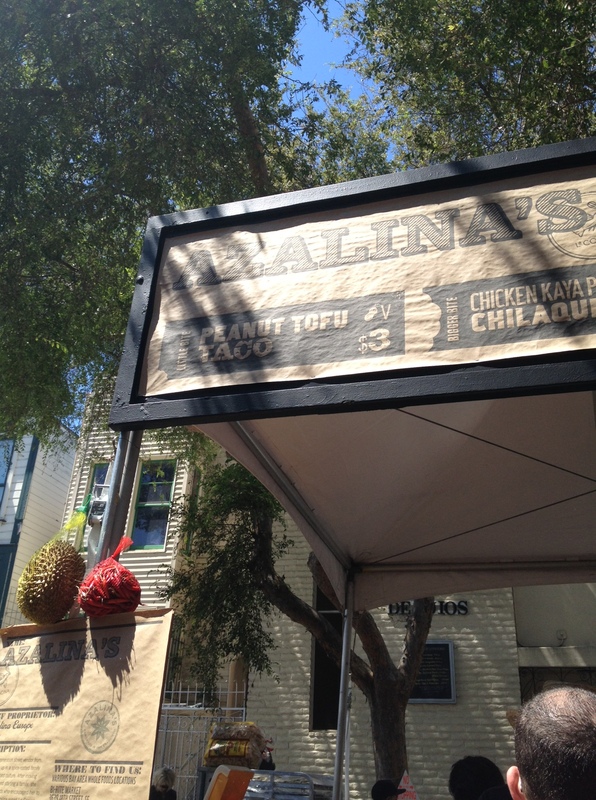 That concluded our culinary adventures at the San Francisco Street Food Festival. And we even got home in time to go to the movies that evening! Of course, before we had even gotten on our BART train, Kyle asked me, “So when is Eat Real?” Yup, we can’t get enough of street food.